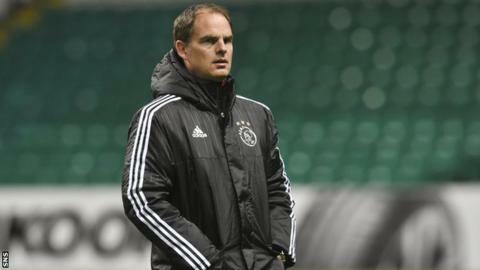 Frank de Boer says his Ajax side will go on the attack in search of a crucial Europa League win against Celtic on Thursday. The Dutch side have three points from their four Group A matches, one more than Celtic, and De Boer believes a draw does not suit either side. "We will be attacking because we need to win," the former Holland defender said. "We have to play very compact, and play with confidence." Ajax and Celtic were expected to be in a three-way fight with Fenerbache to secure qualification for the knockout stage, but Molde have been the surprise package of Group A. The Norwegian champions won in Turkey against Fenerbache, drew at home to Ajax and beat Celtic home and away to seal qualification for the last 32 with two matches to spare. "When everybody looked at the group nobody expected Molde at this stage to be already qualified for the next phase," said De Boer, who won 112 international caps for Holland. "That's very disappointing for Celtic but also for Ajax. We wanted especially at home to get three points every time. We've only got two points from two games, so that's not enough. "That's why we're in this situation and the same counts for Celtic. Both teams have to win." De Boer had a short spell with Rangers in 2004, and having sampled the atmosphere of Old Firm derbies, he says his players should relish the prospect of playing in Glasgow's East End on European night. "Fantastic atmosphere," De Boer recalled of his experience at Celtic Park. "These kind of stadiums, as a young player you dream to play in this kind of atmosphere. Hopefully it's a good experience for the players. "Of course the Celtic players are used to that but not our players."